After months of reading, learning and planning, today was the day! This morning we walked just under a mile away from our house and released three homers. The weather is much better these days and we all took part which made it feel like a special event. 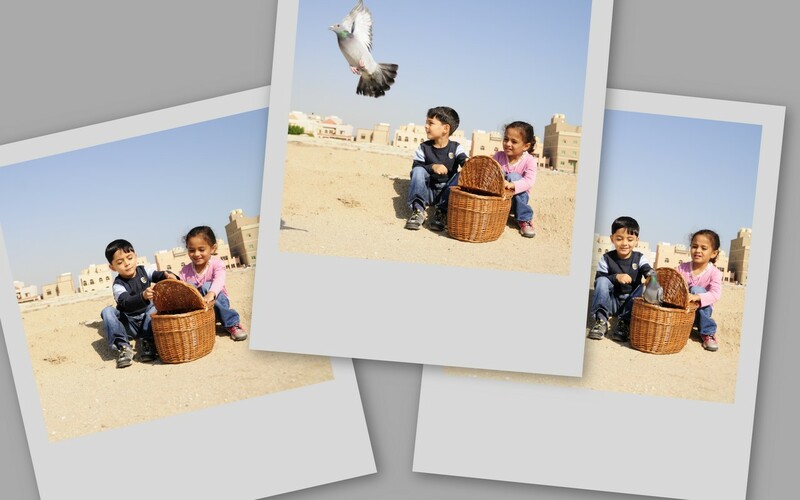 Yousef opened the basket and Noor held it in place. Um Yousef and I watched and I managed to take these three photographs. The first bird out was a little reluctant (see photo on the right), but all three were soon high in the sky. I am yet to see them back home. I think they’ve been and gone again. Overall I’m happy to announce a success. We have lunch with the whole family at my father’s every Friday. My intention is to build up the distance until we reach a release from there (10km away) some time in February. Watch this space. I LOVE that middle photo! Wow! Wasn’t yesterday a great day for walking? And what a great experience for your children and family. It’s my favorite too… I just wanted to put it into context using the others. The weather is great these days… and the experience is wonderful for the children but I have to say I really enjoy it myself. good pets and are great companions to have. We had an angel visit us last night. What a blessing. I wish I would have wrote the tag number down before she left this morning. It started with CL. It was a beautiful, pure white homeing pigeon. It was clearly exhausted and incredible hungry. We fed it and provided shelter for the night. What a beautiful sight, my daughter releasing her early this morning and her flying off, was priceless. She circled our house 3 times before she took off in a NW direction. WE live in New Freedom, PA. Would have loved to know where she came from and where she was going. This has definitly spiked an interest in our family for homing pigions. What a lovely story Laura. White homers are very beautiful and I’m really glad your daughter enjoyed it. i loved this post the most. all this while spending quality time together? Thanks sadia. Appreciate your visit/comment. It’s great fun and you’ve described the benefits really well.